SKU: N/A. Category: Courses. Tags: best python training institute in bangalore, learn python online, online python training, python automation training in bangalore, python training in bangalore. 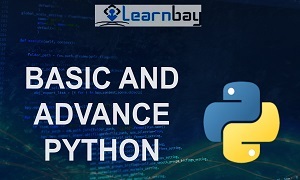 Learnbay provides best Python Training in Bangalore with practicals and hands on project experience for freshers and working professional.Python is an easy to learn, powerful programming language. It has efficient high-level data structures and a simple but effective approach to object-oriented programming. Python’s elegant syntax and dynamic typing, together with its interpreted nature, make it an ideal language for scripting and rapid application development in many areas on most platforms.So,If you are from manual testing background and wants to learn automation,We provide Best Python training in Bangalore Marathahalli for learning automation through Python. Experienced Professional who want to make career in big data with Python. Anyone who has deep desire to learn Python. We Provide Python training Online and in classroom python training in bangalore with 60% theory and 40% hands on,Practice ,Assignment.We provide both online and classroom Python training. Dir and help: Getting help from the Python interpreter. Program to find duplicate characters in a String. Apart from the regular modules of Core Python (up to Chapter 16), we also have optional modules that you can choose from based on your domain and interests. These optional modules are customized according to your career choices. We are proud to say that ours is the best python training in Bangalore as it is designed to suit all jobs based on Python. When you enrol in our course program, you can select the optional module. and filtering a data frame. This Module is designed for testing professional, software developer in test, or web application developer using Python and want to learn Selenium WebDriver to automate browsers for testing their web application. How to write first Behave feature. Note:After you successfully complete the project and the exams, we will award a certification for the successful completion of python course in our Bangalore institute. I have learned a lot from this training.Instructor was very knowledgeable and training was very interactive. Course was Focussed with Clear Examples .All concepts from basic to advance was covered with relevant case study and mini projects. The training is excellent and the material provided was very informative. Training was conducted well and concepts were explained from scratch.Even if you are beginner,course will help you. learned a lot from this training.And this really helped to understand all the concepts very well. Training and course content are very informative.Concepts are explained using examples.overall very happy.. I feel learnbay as best python training center in bangalore.Training has many hands on exercises and real time examples.you should be able to learn both basic and advance python.Best for beginner and Someone working in Manual/Automation Testing. Python course offered by Learnbay is exhaustive, real time and with projects which enhance the skill-set. The Python tutor was very knowledgeable and answered all the questions seamlessly. He has helped us in mastering the concepts and enhanced the skillset. Will definitely recommend to aspiring Python enthusiasts. Trainer was able to demonstrate all the examples from basic to advance concepts.This is best for beginners and intermediate who wants to learn python automation from scratch. They provide best python training in Bangalore. Good course content and Awesome explanation of topics.Strongly recommended for people looking for python automation training. Very good Instructor and awesome python training by learnbay. After attending the classroom training ,I have got access to the Class recordings and Course content.Project support is provided even after the completion of course.